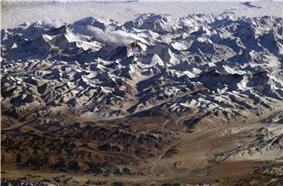 Asia ( or ) is the Earth's largest and most populous continent, located primarily in the eastern and northern hemispheres. Though it covers only 8.7% of the Earth's total surface area, it comprises 30% of Earth's land area, and has historically been home to the bulk of the planet's human population (currently roughly 60%). Asia is notable for not only overall large size and population, but unusually dense and large settlements as well as vast barely populated regions within the continent of 4.4 billion people. Asia has exhibited economic dynamism (particularly East Asia) as well as robust population growth during the 20th century, but overall population growth has since fallen to world average levels. The boundaries of Asia are traditionally determined as that of Eurasia which is not Europe, as there is no clear geographical separation between them, and Asia is in itself originally a European definition. The most commonly accepted boundaries place Asia to the east of the Suez Canal, the Ural River, and the Ural Mountains, and south of the Caucasus Mountains and the Caspian and Black Seas. It is bounded on the east by the Pacific Ocean, on the south by the Indian Ocean and on the north by the Arctic Ocean. The border between Asia and Europe has historically been determined by Europeans only. The original distinction between the two was made by the ancient Greeks. They used the Aegean Sea, the Dardanelles, the Sea of Marmara, the Bosporus, the Black Sea, the Kerch Strait, and the Sea of Azov as the border between Asia and Europe. The Nile was often used as the border between Asia and Africa (then called Libya), although some Greek geographers suggested the Red Sea would form a better boundary. Darius' canal between the Nile and the Red Sea introduced considerable variation in opinion. Under the Roman Empire, the Don River emptying into the Black Sea was the western border of Asia. It was the northernmost navigable point of the European shore. In the 15th century the Red Sea became established as the boundary between Africa and Asia, replacing the Nile. The current boundary between Asia and Africa is the Red Sea, the Gulf of Suez, and the Suez Canal. This makes Egypt a transcontinental country, with the Sinai peninsula in Asia and the remainder of the country in Africa. In Sweden, five years after Peter's death, in 1730 Philip Johan von Strahlenberg published a new atlas proposing the Urals as the border of Asia. The Russians were enthusiastic about the concept, which allowed them to keep their European identity in geography. Tatishchev announced that he had proposed the idea to von Strahlenberg. The latter had suggested the Emba River as the lower boundary. Over the next century various proposals were made until the Ural River prevailed in the mid-19th century. The border had been moved perforce from the Black Sea to the Caspian Sea into which the Ural River projects. In the maps of the period, Transcaucasia was counted as Asian. The incorporation of most of that region into the Soviet Union tended to push views of the border to the south. Asian cultures had no say in this system of determining the imaginary boundaries separating them from Europe. The border between Asia and the loosely defined region of Oceania is usually placed somewhere in the Malay Archipelago. The terms Southeast Asia and Oceania, devised in the 19th century, have had several vastly different geographic meanings since their inception. The chief factor in determining which islands of the Malay Archipelago are Asian has been the location of the colonial possessions of the various empires there (not all European). Lewis and Wigen assert, "The narrowing of 'Southeast Asia' to its present boundaries was thus a gradual process." Geographical Asia is a cultural artifact of European conceptions of the world being imposed onto other cultures, an imprecise concept causing endemic contention about what it means. Asia is larger and more culturally diverse than Europe. It does not exactly correspond to the cultural borders of its various types of constituents. From the time of Herodotus a minority of geographers have rejected the three-continent system (Europe, Africa, Asia) on the grounds that there is no or is no substantial physical separation between them. For example, Sir Barry Cunliffe, the emeritus professor of European archeology at Oxford, argues that Europe has been geographically and culturally merely "the western excrescence of the continent of Asia". Geographically, Asia is the major eastern constituent of the continent of Eurasia with Europe being a northwestern peninsula of the landmass – or of Afro-Eurasia; geologically, Asia, Europe and Africa make up a single continuous landmass (except for the Suez Canal) and share a common continental shelf. Almost all of Europe and the better part of Asia sit atop the Eurasian Plate, adjoined on the south by the Arabian and Indian Plate and with the easternmost part of Siberia (east of the Chersky Range) on the North American Plate. 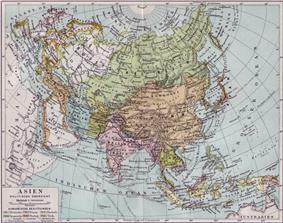 The English word, "Asia," was originally a concept of Greek civilization. The place name, "Asia", in various forms in a large number of modern languages is of unknown ultimate provenience. Its etymology and language of origin are uncertain. It appears to be one of the most ancient of recorded names. A number of theories have been published. English Asia can be traced through the formation of English literature to Latin literature, where it has the same form, Asia. Whether all uses and all forms of the name derive also from the Latin of the Roman Empire is much less certain. Latin Asia and Greek Ἀσία appear to be the same word. Roman authors translated Ἀσία as Asia. The Romans named a province Asia (Roman province), which roughly corresponds with modern-day central-western Turkey. There was an Asia Minor and an Asia Major located in modern-day Iraq. As the earliest evidence of the name is Greek, it is likely circumstantially that Asia came from Ἀσία, but ancient transitions, due to the lack of literary contexts, are difficult to catch in the act. The most likely vehicles were the ancient geographers and historians, such as Herodotus, who were all Greek. Ancient Greek certainly evidences early and rich uses of the name. Some of these are of women held in servitude (as study of the society implied by the content reveals). They were used in trades, such as cloth-making, and usually came with children. 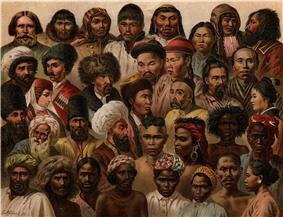 The epithet, lawiaiai, "captives," associated with some of them identifies their origin. Some are ethnic names. One in particular, aswiai, identifies "women of Asia." Perhaps they were captured in Asia, but some others, Milatiai, appear to have been of Miletus, a Greek colony, which would not have been raided for slaves by Greeks. Chadwick suggests that the names record the locations where these foreign women were purchased. The name is also in the singular, Aswia, which refers both to the name of a country and to a female of it. There is a masculine form, aswios. This Aswia appears to have been a remnant of a region known to the Hittites as Assuwa, centered on Lydia, or "Roman Asia." This name, Assuwa, has been suggested as the origin for the name of the continent "Asia". The Assuwa league was a confederation of states in western Anatolia, defeated by the Hittites under Tudhaliya I around 1400 BC. 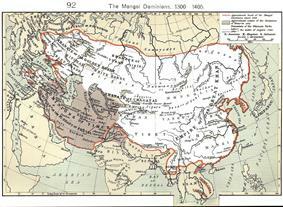 The Mongol Empire, ca. 1300. The gray area is the later Timurid Empire. The Russian Empire began to expand into Asia from the 17th century, and would eventually take control of all of Siberia and most of Central Asia by the end of the 19th century. The Ottoman Empire controlled Anatolia, the Middle East, North Africa and the Balkans from the 16th century onwards. In the 17th century, the Manchu conquered China and established the Qing Dynasty. In the 16th century, the Islamic Mughal Empire controlled much of India. Asia is the largest continent on Earth. It covers 8.8% of the Earth's total surface area (or 30% of its land area), and has the largest coastline, at 62,800 kilometres (39,022 mi). 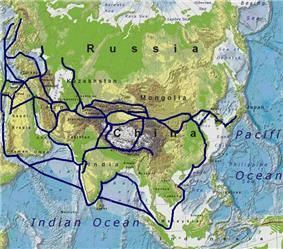 Asia is generally defined as comprising the eastern four-fifths of Eurasia. It is located to the east of the Suez Canal and the Ural Mountains, and south of the Caucasus Mountains (or the Kuma–Manych Depression) and the Caspian and Black Seas. It is bounded on the east by the Pacific Ocean, on the south by the Indian Ocean and on the north by the Arctic Ocean. 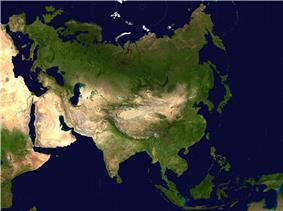 Asia is subdivided into 48 countries, two of them (Russia and Turkey) having part of their land in Europe. Asia has the second largest nominal GDP of all continents, after Europe, but the largest when measured in purchasing power parity. 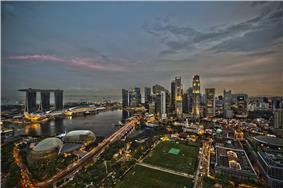 As of 2011, the largest economies in Asia are China, Japan, India, South Korea and Indonesia. Based on Global Office Locations 2011, Asia dominated the office locations with 4 of top 5 were in Asia, Hong Kong, Singapore, Tokyo, Seoul and Shanghai. 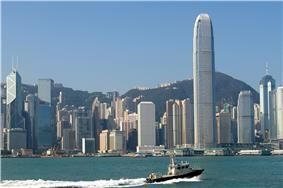 Around 68 percent of international firms have office in Hong Kong. In the late 1990s and early 2000s, the economies of the PRC and India have been growing rapidly, both with an average annual growth rate of more than 8%. Other recent very-high-growth nations in Asia include Israel, Malaysia, Indonesia, Bangladesh, Pakistan, Thailand, Vietnam, Mongolia, Uzbekistan, Cyprus and the Philippines, and mineral-rich nations such as Kazakhstan, Turkmenistan, Iran, Brunei, United Arab Emirates, Qatar, Kuwait, Saudi Arabia, Bahrain and Oman. East Asia had by far the strongest overall Human Development Index (HDI) improvement of any region in the world, nearly doubling average HDI attainment over the past 40 years, according to the report’s analysis of health, education and income data. China, the second highest achiever in the world in terms of HDI improvement since 1970, is the only country on the "Top 10 Movers" list due to income rather than health or education achievements. Its per capita income increased a stunning 21-fold over the last four decades, also lifting hundreds of millions out of income poverty. Yet it was not among the region’s top performers in improving school enrollment and life expectancy. 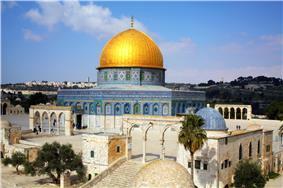 Dome of the Rock on the Temple Mount, in Jerusalem, a holy city for Judaism, Christianity and Islam. Many of the world's major religions have their origins in Asia. Asian mythology is complex and diverse. The story of the Great Flood for example, as presented to Christians in the Old Testament, is first found in Mesopotamian mythology, in the Epic of Gilgamesh. Hindu mythology tells about an Avatar of the God Vishnu in the form of a fish who warned Manu of a terrible flood. In ancient Chinese mythology, Shan Hai Jing, the Chinese ruler Da Yu, had to spend 10 years to control a deluge which swept out most of ancient China and was aided by the goddess Nüwa who literally fixed the broken sky through which huge rains were pouring. The Abrahamic religions of Judaism, Christianity, Islam and Bahá'í Faith originated in West Asia. Judaism, the oldest of the Abrahamic faiths, is practiced primarily in Israel, the birthplace and historical homeland of the Hebrew nation which today consists equally of those Israelites who remained in Asia/North Africa and those who returned from diaspora in Europe, North America, and other regions, though sizable communities continue to live abroad. Judaism is the predominant religion in Israel (75.6%), which has a nominal Jewish population of about 6.1 million, though the matter of distinguishing Jewish religious, cultural and ethnic identity is a complex one. Outside of Israel there are small ancient communities of Jewish still live in Turkey (17,400), Azerbaijan (9,100), Iran (8,756), India (5,000) and Uzbekistan (4,000). Eastern Orthodoxy is the predominant religion. Various Christian denominations have adherents in portions of the Middle East, as well as China and India. Saint Thomas Christians in India trace their origins to the evangelistic activity of Thomas the Apostle in the 1st century. Islam, which originated in Saudi Arabia, is the largest and most widely spread religion in Asia. With 12.7% of the world Muslim population, the country currently with the largest Muslim population in the world is Indonesia, followed by Pakistan, India, Bangladesh, Iran and Turkey. 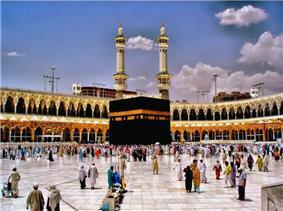 Mecca, Medina and to a lesser extent Jerusalem are the holiest cities for Islam in all the world. These religious sites attract large numbers of devotees from all over the world, particularly during the Hajj and Umrah seasons. Iran is the largest Shi'a country and Pakistan has the largest Ahmadiyya population. 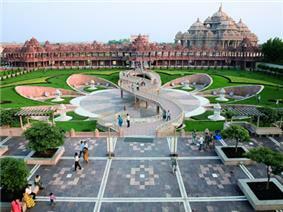 As of 2012, Hinduism has around 1.1 billion adherents. The faith represents around 25% of Asia's population and is the second largest religion in Asia. However, it is mostly concentrated in South Asia. Over 80% of the populations of both India and Nepal adhere to Hinduism, alongside significant communities in Bangladesh, Pakistan, Bhutan, Sri Lanka and Bali, Indonesia. 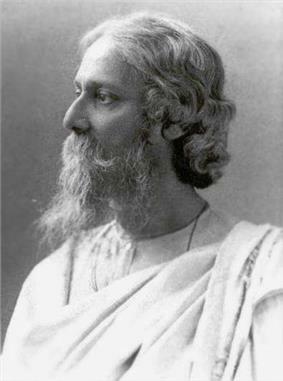 Many overseas Indians in countries such as Burma, Singapore and Malaysia also adhere to Hinduism. Buddhism has a great following in mainland Southeast Asia and East Asia. Buddhism is the religion of the majority of the populations of Cambodia (96%), Thailand (95%), Burma (80%-89%), Japan (36%–96%), Bhutan (75%-84%), Sri Lanka (70%), Laos (60%-67%) and Mongolia (53%-93%). Large Buddhist populations also exist in Singapore (33%-51%), Taiwan (35%–93%), South Korea (23%-50%), Malaysia (19%-21%), Nepal (9%-11%), Vietnam (10%–75%), China (20%–50%), North Korea (1.5%–14%), and small communities in India and Bangladesh. 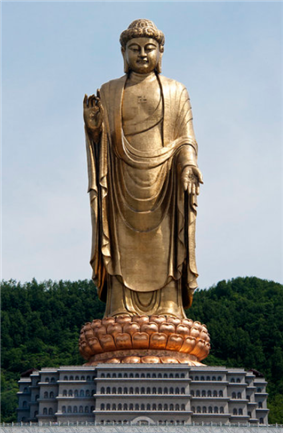 In many Chinese communities, Mahayana Buddhism is easily syncretized with Taoism, thus exact religious statistics is difficult to obtain and may be understated or overstated. The Communist-governed countries of China, Vietnam and North Korea are officially atheist, thus the number of Buddhists and other religious adherents may be under-reported. Also, Mother Teresa of India and Shirin Ebadi of Iran were awarded the Nobel Peace Prize for their significant and pioneering efforts for democracy and human rights, especially for the rights of women and children. Ebadi is the first Iranian and the first Muslim woman to receive the prize. Another Nobel Peace Prize winner is Aung San Suu Kyi from Burma for her peaceful and non-violent struggle under a military dictatorship in Burma. She is a nonviolent pro-democracy activist and leader of the National League for Democracy in Burma (Myanmar) and a noted prisoner of conscience. She is a Buddhist and was awarded the Nobel Peace Prize in 1991. Most recently, Chinese dissident Liu Xiaobo was awarded the Nobel Peace Prize for "his long and non-violent struggle for fundamental human rights in China." He is the first Chinese citizen to be awarded a Nobel Prize of any kind while residing in China. 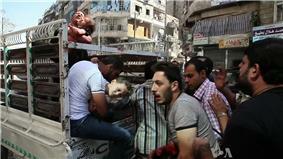 Japan has won the most nobel prizes of any Asian nation, and Israel has won the second most in Asia. Other Asian Nobel Prize winners include Subrahmanyan Chandrasekhar, Abdus Salam, Robert Aumann, Menachem Begin, Aaron Ciechanover, Avram Hershko, Daniel Kahneman, Shimon Peres, Yitzhak Rabin, Ada Yonath, Yasser Arafat, José Ramos-Horta and Bishop Carlos Filipe Ximenes Belo of Timor Leste, Kim Dae-jung, and 13 Japanese scientists. Most of the said awardees are from Japan and Israel except for Chandrasekhar and Raman (India), Salam (Pakistan), Arafat (Palestinian Territories) Kim (South Korea), Horta and Belo (Timor Leste). ^ a b "Europe" (pp. 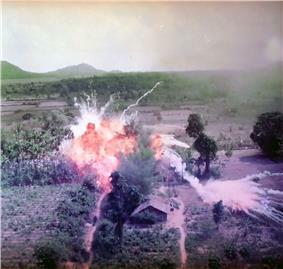 68–9); "Asia" (pp. 90–1): "A commonly accepted division between Asia and Europe is formed by the Ural Mountains, Ural River, Caspian Sea, Caucasus Mountains, and the Black Sea with its outlets, the Bosporus and Dardanelles." ^ . Comment & Analysis: Why Europe is getting China so wrong. Accessed 30 January 2008.Financial TimesChris Patten. ^ The Encyclopedia of Christianity, Volume 5 by Erwin Fahlbusch. Wm. B. Eerdmans Publishing - 2008, Page 285. ISBN 978-0-8028-2417-2. ^ Azerbaijan is a transcontinental country. ^ Egypt is a transcontinental country. ^ Georgia is a transcontinental country. ^ Indonesia is a transcontinental country. ^ Kazakhstan is a transcontinental country. 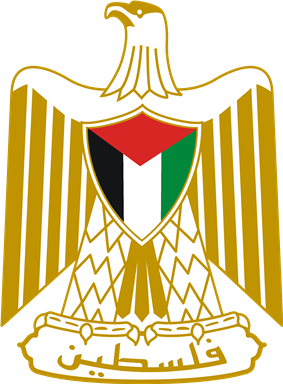 ^ Palestine is a state with limited recognition. ^ Russia is a transcontinental country. ^ Abkhazia is a state with limited recognition. ^ Nagorno-Karabakh is a state with limited recognition. ^ Northern Cyprus is a state with limited recognition. ^ South Ossetia is a state with limited recognition. ^ Taiwan (ROC) is a state with limited recognition.